By the time John Muir and his trusty mule Brownie splashed across the Marble Fork of the Kaweah River in the fall of 1875, the Scottish-born naturalist had already seen his fair share of California grandiosity: Yosemite Valley; the high Sierra; Mariposa Grove. Muir had a thirst for exploration and a talent for storytelling. He founded the Sierra Club and dubbed its synonymous mountains the “Range of Light.” When Muir sauntered upon a montane plateau in what is now known as Sequoia National Park on that autumn day, he found a very large stand of very large trees. Drawing his poetry from the obvious he named it, quite simply, the Giant Forest. California, of course, is in the middle of a historically punishing drought at a time when there’s never been more demand for water. According to the United States Forest Service, 62 million trees have died in California this year alone. Since 2011, a total of 102 million trees have perished, with tens of millions more on death’s doorstep. California’s forests generate fundamental ecosystem services by creating healthy watersheds, providing wildlife habitat, and sequestering atmospheric carbon, and they’re dying at unprecedented rates. Even the great giant sequoias are showing concerning signs of stress. It’s Ambrose and Baxter’s goal to collect and analyze tree samples to understand how the sequoias are faring under these rapidly changing conditions, and what might be done to protect them. But first we have to find them. Anthony Ambrose describes the safety measures the team takes when climbing the giant sequoia trees in Sequoia National Park. A section of a 600-foot static climbing rope dangles from the top of a giant sequoia tree, providing relatively easy access into the tree for scientists. Anthony Ambrose uses a technique called “jugging” to ascend into the crowns of the giant sequoia trees in Sequoia National Park. The giant sequoia has dominated its landscape for millions of years and captivated global imagination since the mid-19th century when rumors of trees the size of fairy-tale beanstalks came roaring out of the Sierras. One of four redwood species, the giant sequoia is not the world’s tallest tree; that crown belongs to its northern cousin, the coast redwood. But in terms of sheer volume of biomass, no living organism ever to walk, swim, fly, or stand on this planet comes close. They are of such stature that people struggle to describe them and so compare them to other very big things: blue whales, 747s, dinosaurs, the Statue of Liberty, elephant herds, space shuttles. Giant sequoias make mice of them all. 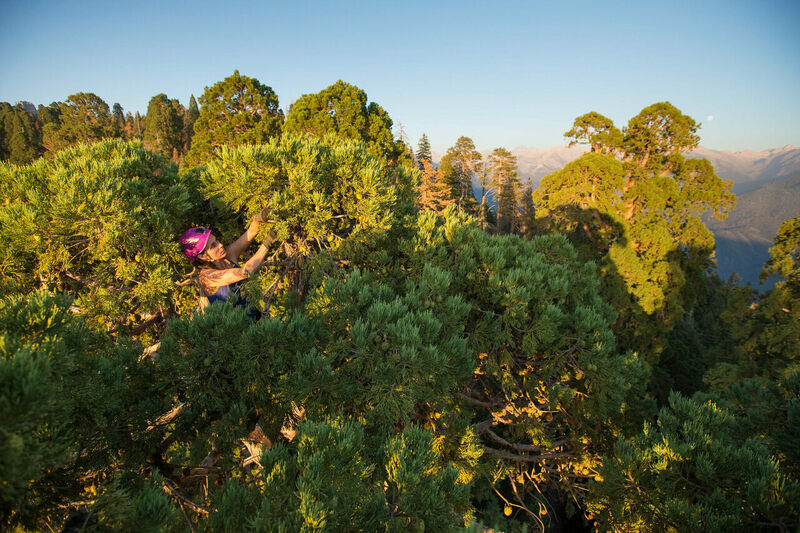 Ambrose collects foliage samples from the top of a giant sequoia tree in Sequoia National Park. Photographer Lincoln Else ascends a fixed climbing rope to film scientists working within the giant sequoia trees. Ambrose collects foliage samples at the top of a giant sequoia tree to measure the impacts of drought and climate change. Baxter assembles and secures the proper gear before climbing to the top of a giant sequoia tree in Sequoia National Park. Baxter ascending a tree in Sequoia National Park. Baxter in the crown of a giant sequoia tree. Numerically speaking, giant sequoias constitute a small portion of California’s forest. A few weeks before my foray with Ambrose and Baxter, I hopped on a survey flight with Greg Asner, principal investigator at the Carnegie Airborne Observatory (CAO), to get a better understanding of what’s happening to trees across the entire state and what that might indicate for the future of the sequoias. A volunteer working closely with scientists from UC Berkeley collects foliage samples from the top of a giant sequoia tree in Sequoia National Park. A laser system next to the imaging spectrometer fires a pair of lasers from the bottom of the plane 500,000 times per second, creating a three-dimensional image of the terrain below, and every tree on it. A second spectrometer, this one with an enhanced zoom capacity, allows the team to take measurements of individual branches on a tree—from 12,000 feet up. Finally, a piece of equipment known as an Internal Measurement Unit records the X,Y, and Z axes as well as pitch, roll, and yaw of the plane to ensure that its positioning in the air doesn’t compromise the accuracy of the data it collects from the ground. “This unit is the same technology as what’s in the nose of a cruise missile,” Asner explained. “Because of that, the State Department has a say in what countries we visit.” The CAO studies forests all over the world—Peru, Malaysia, Panama, South Africa, Hawaii. Once airborne, we dismissed the sprawl of the Central Valley for the coastal mountains. To the naked eye, the Shasta-Trinity National Forest looked splendorous, 2.2 million acres of rivers and mountains. Mount Shasta, a 14,179-foot active volcano, was still holding on to a handsome cap of snow and the landscape was vibrant and green. Asner’s spectrometer shared a different story. “Visual assessment doesn’t tell you much,” he said. On his computer screen, the green trees below were all reading red. They were dead. We just couldn’t see it yet. “A lot of this was not here last year,” he said with the clinical efficiency of a doctor diagnosing a cancer patient. CAO’s statewide findings suggest tens of millions of trees might not survive another dry winter. Baxter records data while taking foliage samples from the top of a giant sequoia tree in Sequoia National Park. Muir’s hyperbole is understandable. The tree I’m sitting atop probably took root before Athenian democracy sprouted in ancient Greece. It has lived through the rise and fall of many of the world’s great civilizations, from Romans to Mayans to the British Empire. Its long shadow has fallen over this forest for three millennia, but that can’t obscure the exhaust of human progress. As I clip my climbing descender onto the rope and begin the journey to the forest floor, I can’t help but wonder: Will this tree stand long enough to witness our own fall? Or will it fall first? Where Will Palm Trees Grow in a Warming World? As temperatures rise, fronds will fan out in unexpected places.